This entry was posted in Uncategorized and tagged bitbeambot. Bookmark the permalink. Jason, that is very cool stuff to play and learn AI/Robotics. I have some questions if you can help me: 1) It’s possible to buy the kit or at least bitbeam pieces ? 2) Regarding laser cut machines can you recommend a cheap and/or entry level machine, techshop is not available in NJ. Looks like Gridbeam is also compatible with Makeblock: (http://www.makeblock.cc/). What kind of screws do you use (Makebot uses standard ISO M4)? Would using metrix 8mm x 8mm bars instead of your 5/16 inch make any difference? By the way, have you considered to automatically drill the holes instead of laser cutting? Maybe one could build a machine with gridbeams that can be used to create even more gridbeams. Sorry, I wanted to write "Bitbeam" instead of "Gridbeam". The latter is another, similar system with 1.5" distance instead of 8mm. Not much updating on this recently, but I thought I’d chip in.Great idea. Might I suggest you go fully metric though? 5/16th of an inch (7.9375mm) in one direction and 8mm in the other makes no sense at all, when the difference is a mere 0.0625mm, or 0.0025".I’m going to be doing my versions as all metric, unless there is a really good reason not to? The difference is not important on a small scale but it sums up to one hole at the size of a meter (125 * 8mm = 1000mm, 126 * 5/16th inch = 1000.25mm). I’d use metric 8mm to be fully compatible with Lego and Makeblock, but I am biased as I’m from a country that uses the metrics system anyway. Jakob, yes, I dream of making a machine made out of bitbeam that can make more bitbeams. That’s on my TODO list. :-)Also, I use 10-32 threaded nuts and bolts with my beams. But I’ve found M5 metric nuts and bolts work about the same. Presently i am looking forward to design some robotic arm which will test the touch screen. 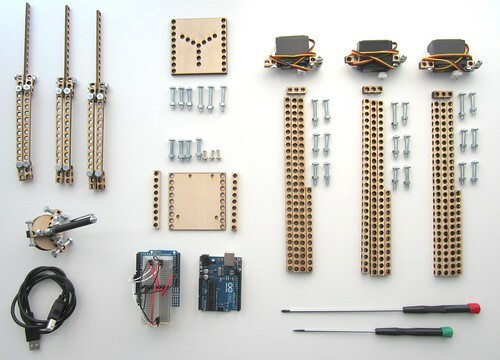 can i get Bitbeambot – The Complete Kit , can you send me the details of it. Like price and specifications. I would like to buy the kit as well. Could anyone tell me from where I can buy that.